I am sitting in a store in Jericho, waiting for our group of a hundred pilgrims while they shop. 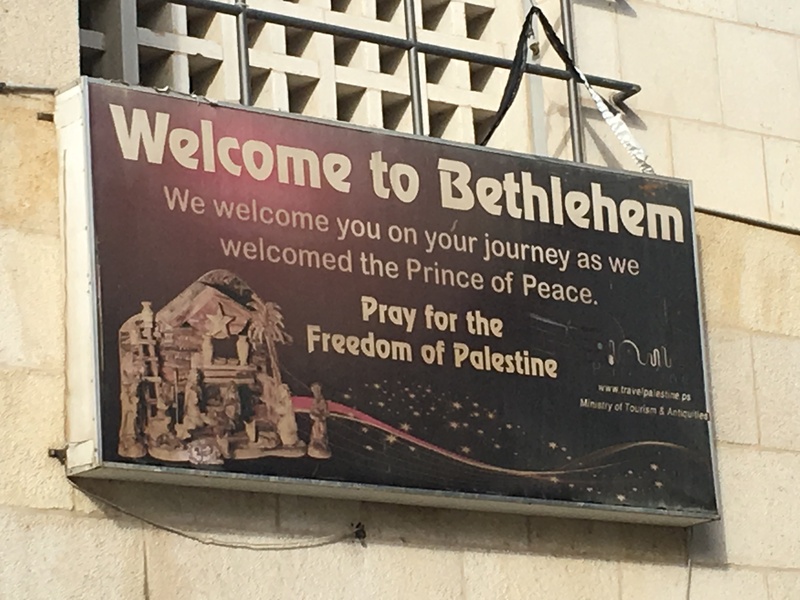 After deciding to post some pictures of our Holy Land pilgrimage on Facebook, a message appears on my phone that I am in Palestinian territory rather than in Israel and therefore do not have service. It suddenly dawns on me that even though our bus moves freely around Israel, the country is still divided. Jericho, located in the disputed West Bank, has been under the administrative control of the Palestinian authority since 1994. I wonder. Will it ever be possible for Jews, Christians, and Muslims to live in peace in this land that is holy for all three world religions? 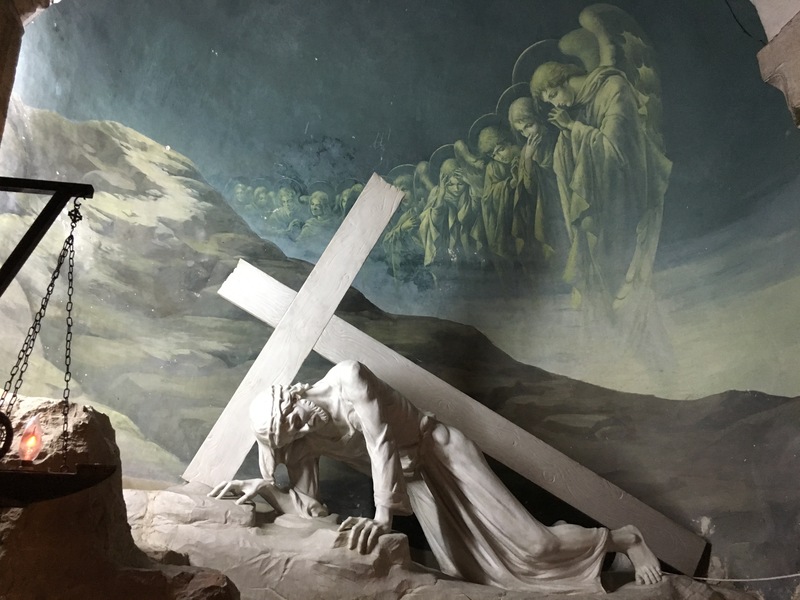 We are walking through the Via Dolorosa, the “Way of Sorrow” in the Old City of Jerusalem, and stop at each of the fourteen stations of the cross. In the Catholic tradition, these stations are a mini-pilgrimage commemorating Jesus’ last day on earth. It is a way for all Christians to experience the agony and suffering of Jesus as he carried his cross to Calvary. I can’t keep back the tears, as I remember the sacrifice that Jesus made for me. I wonder. How is God calling me to share in the suffering of others and change the world? I am at Yad Veshem, the Holocaust Museum of Jerusalem. In the Children’s Memorial, which is carved out of an underground cavern, the names of the 1.5 million children who were murdered by the Nazis are read continuously as they shine like stars in the firmament. And in the Hall of Names, each one of the six million victims will be remembered for generations to come. I can’t stop the tears. I am mesmerized by The Little Smuggler, a famous poem by the Polish poet Henryka Łazowertówna (1909–1942). [i] It tells the story of a little child in the Warsaw Ghetto who smuggles food over from the “Aryan Side” to feed his family and whose primary fear is that if he dies, his mother would lose her source of life. I wonder. How many children in our world are still at risk today because of war, oppression, and injustice? What is my responsibility? I am walking through the Church of the Holy Sepulchre in Jerusalem, the traditional site of the crucifixion. Since an 1852 mandate, the care of the church is shared by six different Christian denominations. Despite incidents of territorialism among the groups, the steep stairway climbing to the lavishly decorated shrine of Calvary unites pilgrims and takes my breath away. I wonder. Jesus, how can it be that you gave up your life for me and all humans who ever lived? I offer to you all that I am and all that I hope to become. May I reflect your grace and hope in everything I say and do. Our tour is divided into groups of four as we eat dinner in the homes of Palestinian families in the Bethlehem area of the West Bank. It is agonizing to hear how difficult life is for our Christian host family, living under occupation. In the fifty years since the Israeli seizure of the West Bank during the six-day war in 1967, not much has changed. 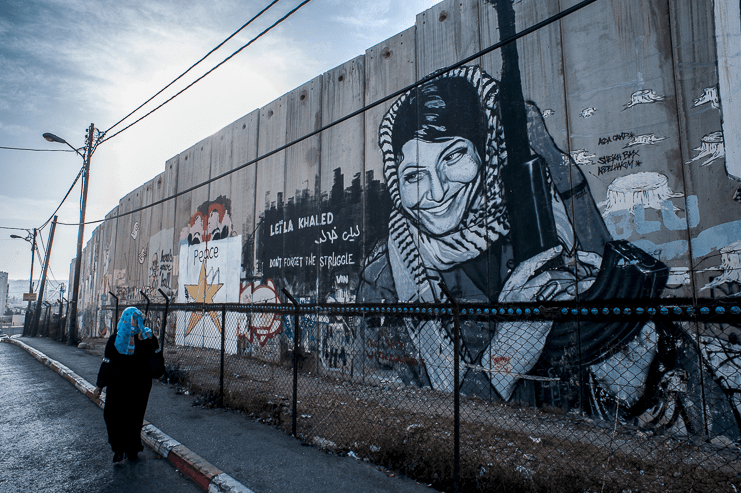 A wall separates Palestinians from Israelis, and daily life is marked by a Separation Wall, checkpoints, guards, segregation, control, and Jewish settlements springing up on Palestinian land. Palestinians are not allowed in most areas of Israel, and those who do work in Jerusalem spend hours a day waiting to go through checkpoints. The unemployment rate in the West Bank is astronomical, poverty is widespread, and the public schools are poor. Our dinner with Palestinian families is a highlight of our pilgrimage, as we sit at table with Christians and Muslim families, who are minorities and struggle with everyday living. It can take years to get a visa to travel outside the country, yet their faith is deep. The day before we ate dinner with our new Palestinian friends, Central United Methodist Church in Detroit, which voted to become a sanctuary church in 2017, announced that they are offering sanctuary to Ded Rranxburgaj, 48, a Coney Island restaurant cook who is scheduled to be deported to Albania on January 25. 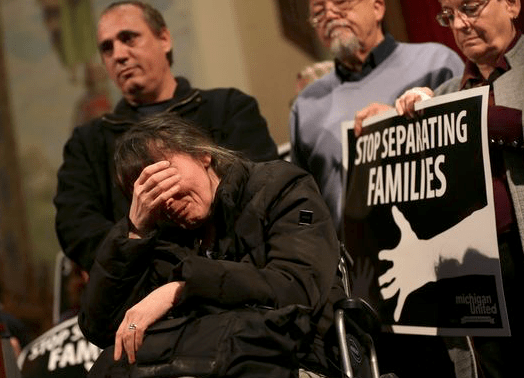 Rranxburgaj and his wife Flora came to the U.S. seventeen years ago, and he is the sole caregiver for his wife, who has MS. Ded said that he has no criminal record and has been working for years with immigration officials to get legal status. I wonder. How is God calling you and me to a resurrection faith that advocates for fullness of life for all people? How is God calling us to practice our faith by caring for the very least of God’s children? How is God calling us to share as well as embody the love of Jesus for all people in our world? I flee, dart like a cat. With fear ever in my heart. Eat your fill of bread. Quiet as a shadow I move. I feel your tears Bishop Laurie. Bishop, I have wondered many of these things since first visiting the West Bamk and Gaza during the 1st Intifada with “Eyewitness Israel.” It was in 1988 and I went back again in 1989 and things had just gotten worse. Now, you find, some 30 years later, how much, much worse it is for the Palestinians. Thank you for your witness> and all of those traveling with you. 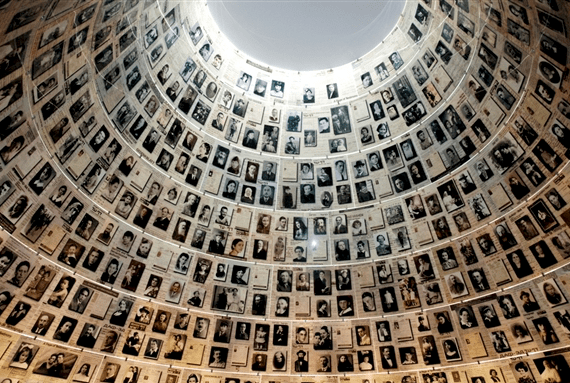 So enjoying your posts on your trip – I cried too at Yad Vashem – all those children – ! I was very moved by your post today. Thank you so much for sharing. I, too, wonder…and pray. It was 1990 when I was there. Still wondering with heavy, God-granted-compassionate-heart. Thank you for such heart filled and questioning words as well as for granting your readers an insight into lives of yet another suffering people. Thankful for those who travel there and return with ever deepening faith—and hope. Thank you for reminding us yet again of a situation that has been going on for years and is no secret. Help us to consider the many options that we have to take actions for a just peace that is fair to Palestinians and Israelis. Then, motivate us to make that most risky step of actually following through on courageous actions that will show that we are the children of the God of all people of the Earth and want justice for all. The United Methodist Women years ago held a courageous and in-depth study on this issue at the then School of Christian Mission. We have all been aware of the plight of the Palestinians who are suffering under an apartheid-like structure of the much better financed, thanks to U.S. tax payers, Israeli government. Your leadership is needed to help us face uncomfortable truths and to be honest when we share complicity in systems that cause oppression, for in a democracy we are all responsible for the decisions and actions of our elected officials. May God have mercy on us when we turn away our heads and refuse to see the actions for justice and peace that we could take which would result in a better world for all of God’s children.